There are millions of aliens in the world of science-fiction, but only 25 made it into your list of the greatest aliens of all time. 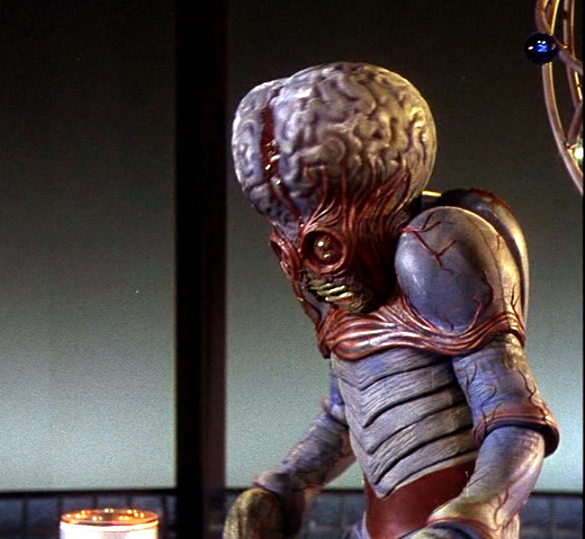 Read on to find out who made the list and who you voted for the greatest alien of all-time. 25. 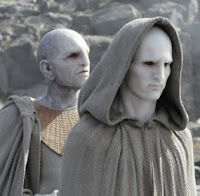 Klaatu from "The Day the Earth Stood Still"
Klaatu is the alien from the 1951 science fiction film The Day the Earth Stood Still and, to lesser extent, its 2008 remake. The first film, played by Michael Rennie, is the most iconic. 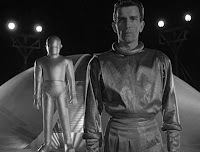 With a flying saucer and his giant robot, Gort, he's a peaceful ambassador from an extraterrestrial confederation and gets shot several times trying to bring peace. But, he keeps on trying, and sends a message that peace is worth fighting for. "Klaatu barada nikto!" 24. 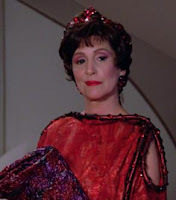 Lawaxana Troi from "Star Trek: The Next Generation"
The mother of the Enterprise ship's counselor Deanna Troi, Lwaxana Troi (Majel Barrett-Roddenberry) was a Betazoid Federation ambassador. Loud, flamboyant and opinionated, the daughter of the Fifth House of Betazed, the Holder of the Sacred Chalice of Rixx, and Heir to the Holy Rings of Betazed never let anyone forgot her status. 23. Jake from "The Cat from Outer Space"
The star of the 1978 Disney film Cat from Outer Space is another flying saucer jockey. When his ship crash-lands on Earth, the government takes the ship and it's special collar. 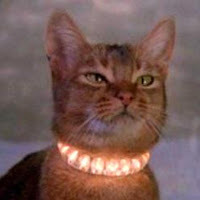 Turns out Zunar-J-5/9 Doric-4-7 looks exactly like your average house cat and is adopted by Dr. Franklin 'Frank' Wilson (Ken Berry) and Dr. Elizabeth 'Liz' Bartlett (Sandy Duncan). Madcap adventures follow in your typical 70s Disney movie, but in the end, the Cat from Outer Space saves the day. Depending on your view of cats, this is either the exactly what real cats would do or proof he's an alien. First seen in the Derelict ship in Allen and nicknamed "Space Jockeys," The Engineers (also called Pilots,Ossians or Mala'kak) are the most highly advanced ancient extraterrestrial race in the galaxy. These masters of genetic engineering are bald, seven foot tall and muscular with black eyes. While benevolent, the Engineer encountered by the crew of the USCSS Nostromo was tempermental and angry. 21. 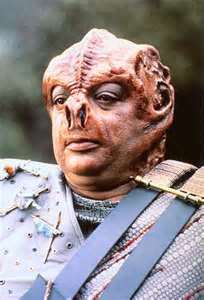 Dathon from "Star Trek: The Next Generation"
The Star Trek: The Next Generation episode "Darmok" featured a truly unique alien race called the Tamarian. When the starship Enterprise is sent to make contact with them, they are both frustrated with their inability to communicate. While the universal translators work fine, it sounds like a bizarre string of non-sensical phrases. The Captains of both ships, Dathon (Paul Winfield) and Picard (Patrick Stewart) are suddenly transported to the surface of a nearby planet and the ship's transporters are rendered useless. Fear sets in. But, over time, the answer is revealed and Dathon gave his life to bring peace and understanding. Dathon showed that true understanding comes from recognizing our differences. 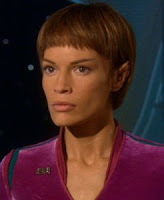 The episode was also the acting debut actress Ashley Judd, as Ensign Robin Lefler. "Someone's got to teach that guy how to die!" Jack O'Neill once said. 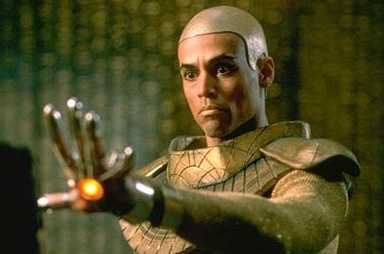 On the television show Stargate SG-1 Apophis (Peter Williams) is a Goa'uld System Lord and the main villain. After his brother, Ra, is killed by Daniel Jackson and Jack O'Neill he takes control. His attacks on Earth restarts the Stargate Program. Arrogant, egotistical and a powerful fighter he enjoyed torturing his enemies. Apophis knew his limitations though and was willing to seek help with his long-range plans. He died saying the name of his wife. 19. 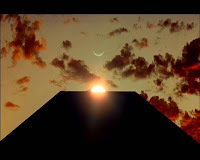 Aliens of "2001: A Space Odyssey"
The 1968 science fiction film 2001: A Space Odyssey, produced and directed by Stanley Kubrick, featured a mysterious alien race that has guided human progress for thousands of years. While they were never shown in the film, Kubrick described them as having progressed from biological beings to "immortal machine entities" and into "beings of pure energy and spirit". 18. T'Pol from "Star Trek: Enterprise"
17. 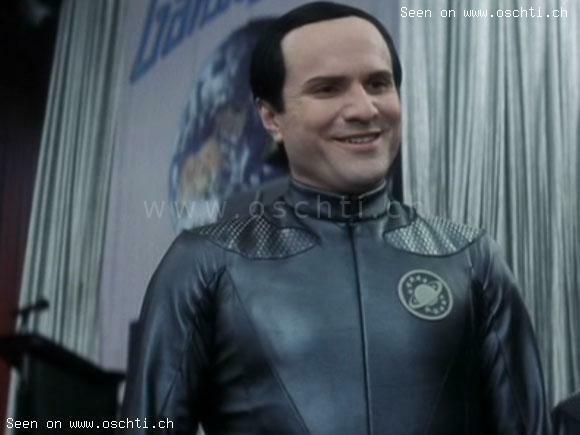 Mathesar from "Galaxy Quest"
Mathesar is the leader of the alien race known as Thermians. While Thermians are octopoids, they have the ability to appear as a white-skinned, gray-clad, black-haired humans. Actor Enrico Colantoni is credited with the awkward movements and bizarre voice. In their humanoid form they smile constantly, even when sad or scared. 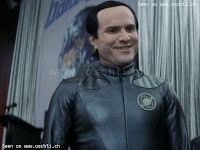 Mathesar shows an incredible loyalty to his people and the crew of the Galaxy Quest. In the end, he showed himself courageous, and became a hero to his own people. 16. Stitch from "Lilo and Stitch"
Lilo & Stitch is a 2002 animated movie about a little girl who befriends Experiment 626 after he lands on Hawaiian Island of Kauai. She names him Stitch and treats him like a dog, but soon he becomes a dear friend. 15. Mork from "Mork and Mindy"
Mork first appeared in the Happy Days episode, "My Favorite Orkan". He was played by, then-unknown, comedian Robin Williams. 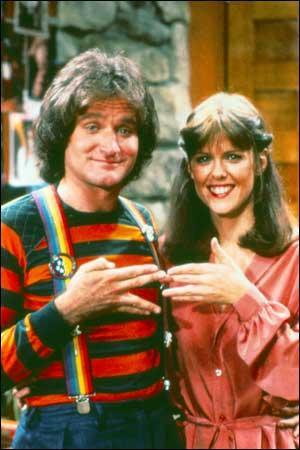 The spin-off series "Mork and Mindy" had Mork coming to Earth to observe humans and befriending 21-year old Mindy (Pam Dawber). His misunderstanding of human culture made him both hilarious and endearing. 14. 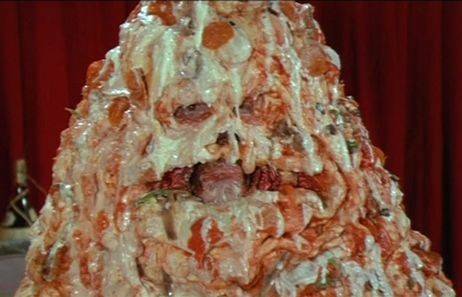 Pizza the Hutt from "Spaceballs"
A parody of Star Wars' Jabba the Hutt, Pizza the Hutt (voice of Dom DeLuise) looked like a giant slice of pizza, but he had the attitude of the Godfather. Captain Lone Starr owed him a debt and Pizza made sure he wouldn't forget it. Pizza died when he was locked in his limo and ate himself. This is proof of the humor, or lack of it, depending on your view of the film. 13. 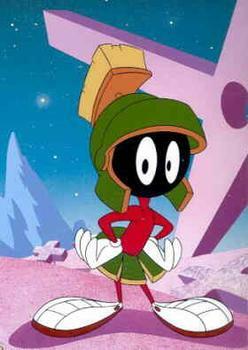 Marty the Martian from "Looney Tunes"
Marty the Martian made his first appearance in the 1948 Bugs Bunny cartoon Haredevil Hare. While easily outwitted, his vast arsenal of Martian weapons and evil mind made him a formidable foe. The Commander of Flying Saucer X-2 has a short temper and even shorter legs. Armed with his "Illudium Q-36 Explosive Space Modulator" Marvin has tried to destroy the Earth numerous times and failed. This makes him very angry. Very angry indeed. Isabel Evans (Katherine Heigl) is one of six alien-human hybrids. The television series is based on the Roswell High young adult book series, written by Melinda Metz and Laura J. Burns. Outgoing and bossy she has the alien ability to "Dream Walk" through the thoughts and dreams of others. She's walked through the dreams of more than one blogger. 11. 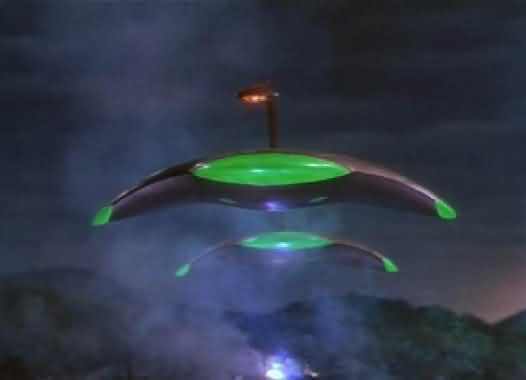 Aliens of "War of the Worlds"
Based on the science fiction novel War of the Worlds in 1898 by H. G. Wells, several movies have told the story of a Martian invasion of Earth. The most recognizable one is the 1953 film starring Gene Barry. The image of the floating ships with their eye stalk and three fingered hands are still terrifying. As is their ridiculous lack of preparation for Earth disease. It won an Oscar for its special effects and was later added to the Library of Congress' National Film Registry. 10. 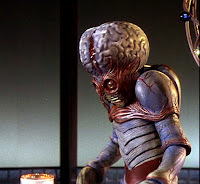 The Mutant from "This Island Earth"
In 1955 the movie This Island Earth, directed by Joseph M. Newman, featured the bulbous-headed Mutants. Enslaved by the people of Metaluna as workers they ended up attacking their masters. While the movie is famously lampooned by the Mystery Science Theater 3000 movie, at the time, it had ground-breaking special-effects. 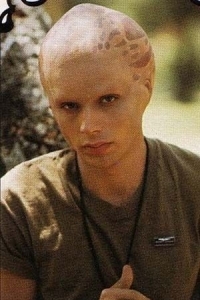 The teenage son of George Fransisco, Buck Francisco (Sean Six) is one of hundreds of alien "Newcomers" living in Los Angeles in the 80s show Alien Nation. While he is the son of a proud policeman, his frequent fights for the rights of Newcomers sometimes put him at odds with the law. At first, he hated humans, but eventually comes to love them like his father. 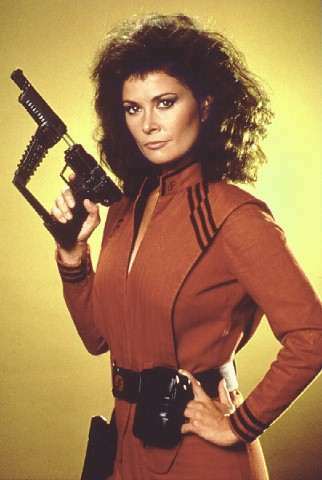 Ruthless and beautiful, the alien Visitor Diana (Jane Badler) is the second-in-command, as well as John's chief science officer of the fleet of 50 Visitor ships. She uses her sexuality and feminine wiles to gain position over the men around her, all while eating a Guinea Pig or two. 7. Q from "Star Trek: The Next Generation"
Captain Jean-Luc Picard described him best when he said, "He's devious and amoral and unreliable and irresponsible and... and definitely not to be trusted." Technically, Q is the name of an entire race of aliens. 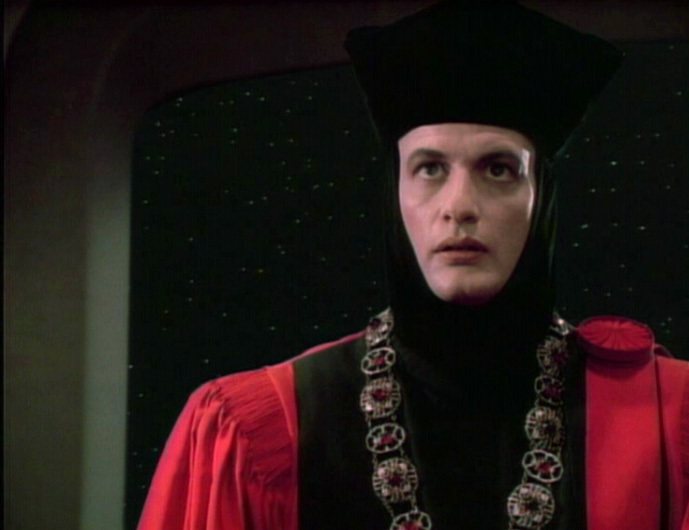 But the best known one is played by John de Lancie. He is supposedly omnipotent and has vague motivations. 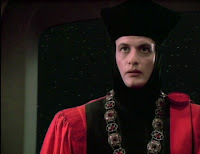 First seen in the pilot episode of Star Trek: The Next Generation, Q returned again and again because of his hilarious dramatic chemistry with Captain Jean-Luc Picard. The Martian Manhunter (J'onn J'onzz) is a member of The Justice League and a DC comics superhero. First appearing in Detective Comics #225 (Nov. 1955). The last surviving Martian, he has green skin and can change his shape. A tragically quiet figure, Martian Manhunter is a true outsider and beloved by comic fans everywhere. The alien known as E.T. was abandoned on Earth and befriended by Elliott (Henry Thomas). He and Elliott fought government scientists and formed a strong bond. 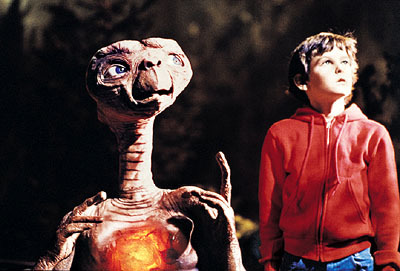 The alien was based on an imaginary friend Spielberg created in 1960 after his parents' divorce. He's brought hope and joy to millions of others. "What the h**l are you?" 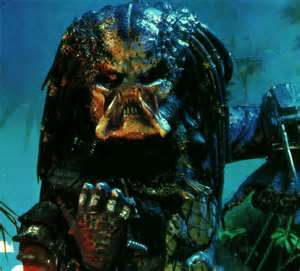 The Predator is an alien species featured in the Predator science-fiction films. He is a trophy hunter tracking down fighters for sport. With his camouflage suit and host of weapons he returned in the sequels Predator 2 (1990), and Predators (2010), as well as an appearance in the cross-over series, "Aliens vs. Predator" in the films Alien vs. Predator (2004), and Aliens vs. Predator: Requiem (2007). 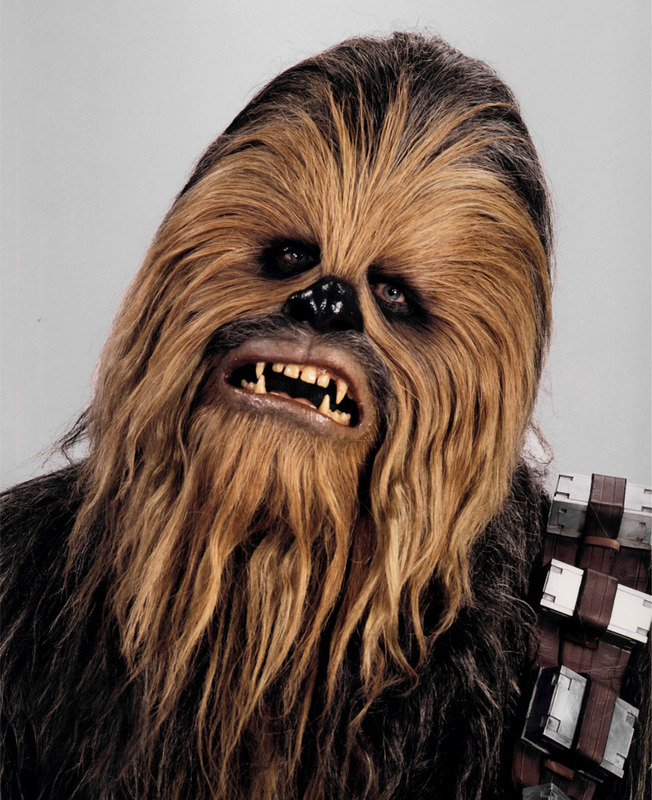 Chewbacca the Wookiee (Peter Mayhew) was an immense, fur covered hero. 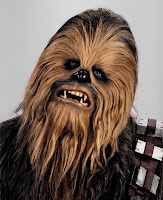 Born on Kashyyyk over two centuries before the Battle of Yavin, Chewbacca was an expert pilot and mechanic of the spaceship, the Millennium Falcon. With compassionate blue-eyes in a warm fuzzy face he was fiercely loyal to his friends. I say was, because he gave his life for his friends. The "Walking Carpet" is missed. 2. Spock from "Star Trek"
From the planet Vulcan, the green-blooded "pointy-eared" Spock was the science officer and first officer of the Star Trek starship Enterprise. 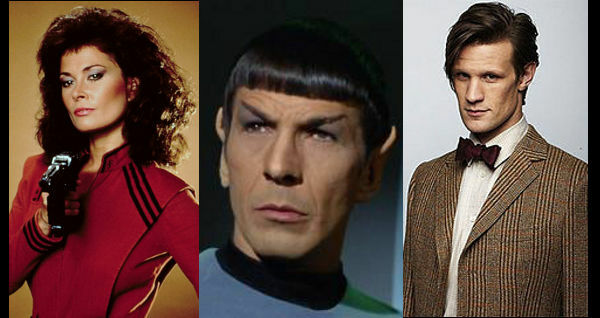 Half human, and half-Vulcan, he constantly struggles between the logical and emotional sides of his personality. Warm, caring and giving he hid his emotions behind a veneer of cold logic. Unlike the greatest alien of them all. 1. The Doctor from "Doctor Who"
The star of the long running science-fiction show Doctor Who since 1963. A Time Lord from the planet Gallifrey the man known simply as "The Doctor". Besides having two hearts he has the ability to "regenerate" into a new body. He's been played by eleven actors: William Hartnell, Patrick Troughton, Jon Pertwee, Tom Baker, Peter Davison, Colin Baker, Sylvester McCoy, Paul McGann, Christopher Eccleston, David Tennant and Matt Smith. 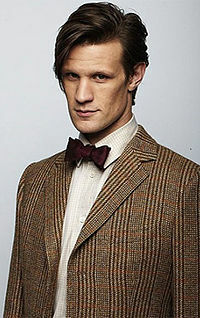 Every time he regenerated he stayed the same. He's a fun-loving adventurer and scientist with a strong moral sense. Using his TARDIS to explore time and space, he explored our hearts. He is the greatest alien of all time. Londo Mollari from "Babylon 5"
Mr Pelham from "Alfred Hitchcock Presents"
Ronan Dax from "Stargate Atlantis"
See the results of the "Who's Your Favorite Alien?" Poll and visit the awesome blogs that submitted entries for the poll. What do you think of the list? Who's your favorite alien? Poll: Who's Your Favorite Alien? Dr. Who was number one? Really? Should've been more from Stargate. At least Ronan got a mention. So we like aliens who are basically human? I voted for Chewie; he would pull Dr. Who's arms off and club him to death with them. He showed up in a lot of the posts. Marvin the Martian was another popular favorite. gotta love the aliens... with out them, we would only be humans... boring! Honestly, I love them all. I really did enjoy Lawaxana. She was great. Doctor Who--I really need to watch that show sometime. Two things: My #1 vote goes to Q. Next, I'm really happy this list didn't end with Superman as #1. Good stuff. 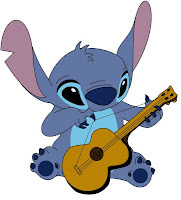 Ak ak ak ak akak ak ak ak ak ak ak akak akak ak. I was surprised by some of the results, but not that one Alex. Pizza the Hutt got more than I expected. Pat, always let the Wookie win! Aliens are the spice of life Jeremy. I'm glad she made the list too MPax!